If you would have told my 10 year old self that when I grew up I’d be washing my face with rose petals, I’d have said “So you’re telling me I did grow up to be a Supermodel-Princess-Anthropologist-Millionaire?!”. 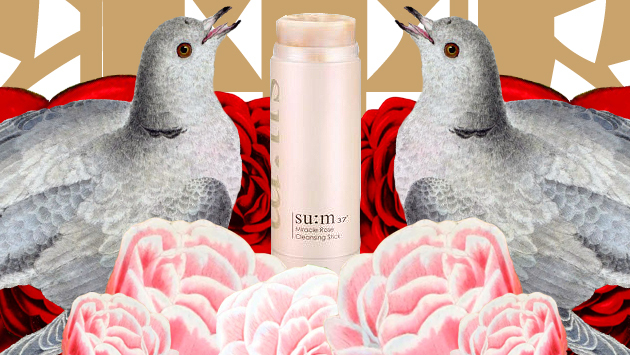 Well, I may have grown up to be a lowly anonymous beauty blogger, but I am still washing my face in pure luxury thanks to the Su:m37 Miracle Rose Cleansing Stick. I’ve been meaning to write this review for awhile and by now you’ve probably already heard the praise heaped upon this product by my beauty blogger peers. I’m here to tell you every bit of it is totally deserved. In case you have’t yet heard of this wondrous pink baby, allow me to introduce you to your new best friend. When I first heard about this product from my girls over at The Wanderlust Project and Skin&Tonics, the unusual presentation of a cleanser in stick form was enough to get me to sign on. Housed in a sturdy plastic tube that reminds me of a glamourous industrial sized glue stick, this twist up cleanser is solid like a soap, but much creamier and softer. To use you simply twist it up a couple of millimeters, apply to your wet face in a circular motion, and then lather as you would any other cleanser. Speaking of lather, this one’s is like a rose scented marshmallow cloud. If I had to guess what unicorns used to wash their face, I couldn’t imagine them choosing anything but this product. It’s unbelievably lush and creamy. Ugh, it’s heavenly. You really feel like you’re doing something special to pamper your skin rather than just the routine, boring, chore of washing your face. Keep in mind before I tried this cleanser, I was perfectly happy with my CerAve cleanser, and I still use it just to switch things up, but now I can’t imagine my routine without the Miracle Rose Cleansing Stick in there at some point. In addition to smelling, and feeling like a rosy dream, this cleanses superbly. It leaves my skin feeling clean but insanely soft. I really dislike cleansers that rob your skin of it’s moisture in the name of ‘squeaky clean’. This is the opposite of that, it leaves me feeling more supple than before I washed my face when I’m experiencing dryness. That being said, it’s not overly heavy if my skin is behaving normally. Another huge plus for this already brimming with positives cleanser, is it’s portability. Traveling with your regular cream or foam cleanser is such a pain. 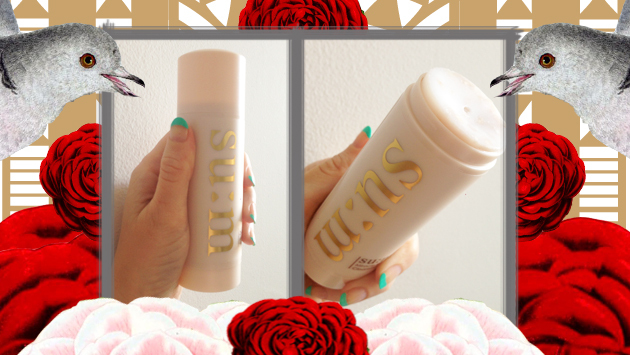 This plastic tube keeps your cleanser protected, takes up minimal space, and will never be subject to those B.S. liquid limits at the airport. It’s slim upright design also lends itself perfectly to your precious bathroom storage space. If you live in the city like I do, you’ve got a bathroom like a closet and space is always an issue, especially when you follow a multi-step routine. Keep in mind before I tried this cleanser, I was perfectly happy with my Cerave cleanser, and I still use it just to switch things up, but now I can’t imagine my routine without the Miracle Rose Cleansing Stick. Packed with ingredients that boast basically every good “anti” you could ask for: antioxidant, anti-inflammatory, antibacterial, and emollient properties, Miracle Rose Cleansing Stick certainly lives up to the name Miracle for me. Five out of five turtles, plus one, earning a holy grail status. My friend has this and she LOVES it! I was surprise at how big it was when I saw hers – we both thought it would be the size of a small glue stick for some reason… I heard it’s discontinued though? Oh it is so big! Such a shame it is out of my budget though, I would love to try this! I love anything rose scented so this is right up my alley! I’m also a total sucker for their neat packaging, haha. I must try this out for myself soon… Could you also do a review of Vain Pursuits? I’ve been hearing a lot about them lately and would love to get a second opinion!